Casual dining is available up on Deck 11 at the indoor-outdoor La Terrazza Buffet, which is separated by smoked glass dividers from the ship's pool area. The cafe's interior is pleasantly decorated in shades of brown and cream, with a marbled floor and smart beech, walnut, glass and chrome dividers. Wood-topped tables are inlaid with marble, chairs are comfortably cushioned, and large windows on three sides give a light and airy feel while outside, white globe lamps and a solid wood bar create a popular alfresco dining and meeting place. Overall, the food is good quality; salads are crisp and freshly cooked pasta, pizza and grilled food is offered at lunchtimes; but some meat dishes are a little stringy. Surprisingly, there was little queuing, as the largely Italian clientele on my cruise quickly got the hang of using separate service islands. That said, expect a fair bit of barging in and reaching across you. Sinfonia also has two formal restaurants, the larger of which is Il Galeone on Beethoven Deck (5). Terracotta and green decor, lacquered wood trim, large porthole windows and lush plants give this restaurant the relaxed feel of a pretty garden room. And though it has only one table for two, getting an unshared table at open-seating lunchtime was not a problem -- though being an English speaker on an Italian ship undoubtedly helped (this is one situation in which it's best not to demonstrate your skills as a polyglot). 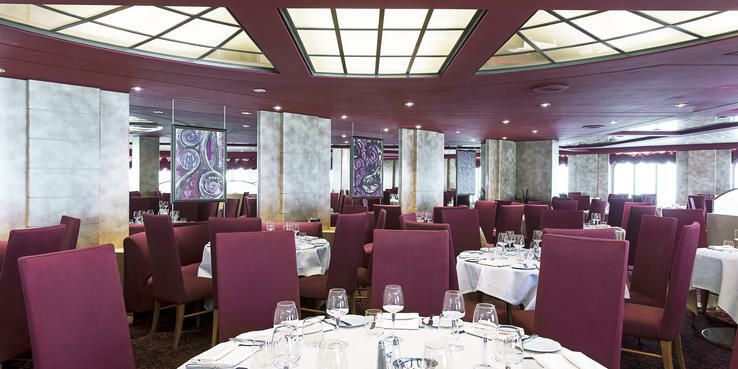 The ship's prettiest restaurant, though, is the smaller and more intimate Il Covo, which overlooks the stern of Mozart Deck (6). This has a pretty entrance with an Italian waterfront mural, decor of warm terracotta and cream, large windows and more tables for two than Il Galeoni, and so is a better choice for couples that prefer to eat a deux. The food is the same in both restaurants; a typical dinner menu features potato and squid salad, salami and provolone cheese or tomato and mozzarella as starters, followed by tomato or minestrone soup (no cold fruit soup nonsense here, thank goodness). The good-quality pasta or risotto course is worth making room for as main courses are more variable, ranging from excellent swordfish steaks and pork piccatas to rather flabby vegetarian pancakes. You can always fill up on puddings, though; as ever in Italy, the ice cream is good, and the ship has a talented pastry chef whose light-as-air vanilla millefeuille with zabaglione sauce was particularly memorable. Both restaurants offer a substantial and affordable wine list, with reds ranging from 15 euros ($20.25) for Argentinean Malbec to 28 euros ($37.80) for a lovely Lacrima Christi and 55 euros ($74.25) for an excellent Barolo. White wines start at 20 euros ($27) for Frascati and 22 euros ($29.70) for Pinot Grigio, and range up to 65 euros ($87.75) for Veuve Cliquot.